The ride of the three men triggered a flexible system of “alarm and muster” that had been carefully developed months before, in reaction to the colonists’ impotent response to the Powder Alarm of September 1774. This system was an improved version of an old network of widespread notification and fast deployment of local militia forces in times of emergency. The colonists had periodically used this system all the way back to the early years of Indian wars in the colony, before it fell into disuse in the French and Indian War. In addition to other express riders delivering messages, bells, drums, alarm guns, bonfires and a trumpet were used for rapid communication from town to town, notifying the rebels in dozens of eastern Massachusetts villages that they should muster their militias because the regulars in numbers greater than 500 were leaving Boston, with possible hostile intentions. 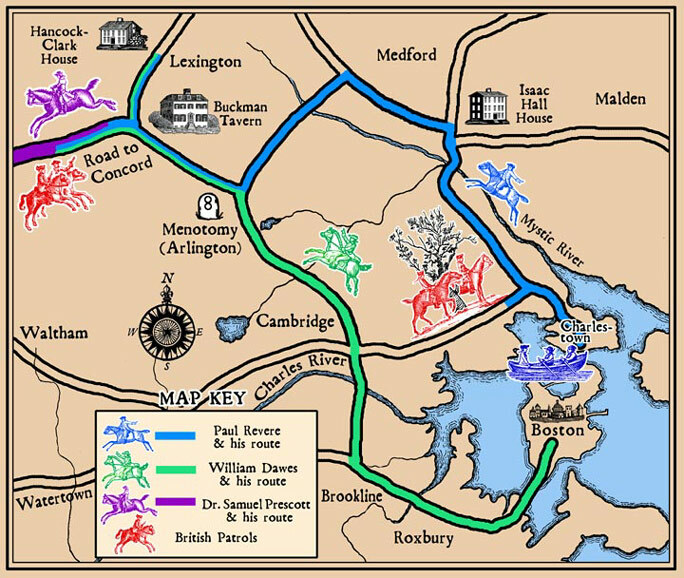 This system was so effective that people in towns 25 miles (40 km) from Boston were aware of the army’s movements while they were still unloading boats in Cambridge. Revere, Dawes, and Prescott were detained by a British Army patrol in Lincoln at a roadblock on the way to Concord.Prescott jumped his horse over a wall and escaped into the woods; he eventually reached Concord. Dawes also escaped, though he fell off his horse not long after and did not complete the ride.Unlike in the Powder Alarm, the alarm raised by the three riders successfully allowed the militia to repel the British troops in Concord, after which the British were harried by the growing colonial militia all the way back to Boston.